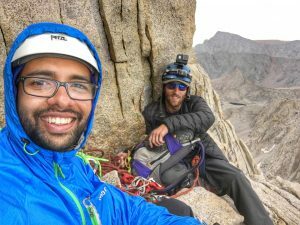 On July 28th, 2018, Tyler and I climbed Mt Russell via the Fishhook Arete. Fishhook Arete is an aesthetic alpine-rock route in the Sierra Nevada which has excellent quality rock, tremendous exposure, and technical climbing at a respectable elevation of 14,000+ feet. Unmistakably visible from a distance the arete dominates the northward Sierra skyline as seen from the top of Mt Whitney. It is a route that has been on my to-do lists simply because of its elegance and beauty. 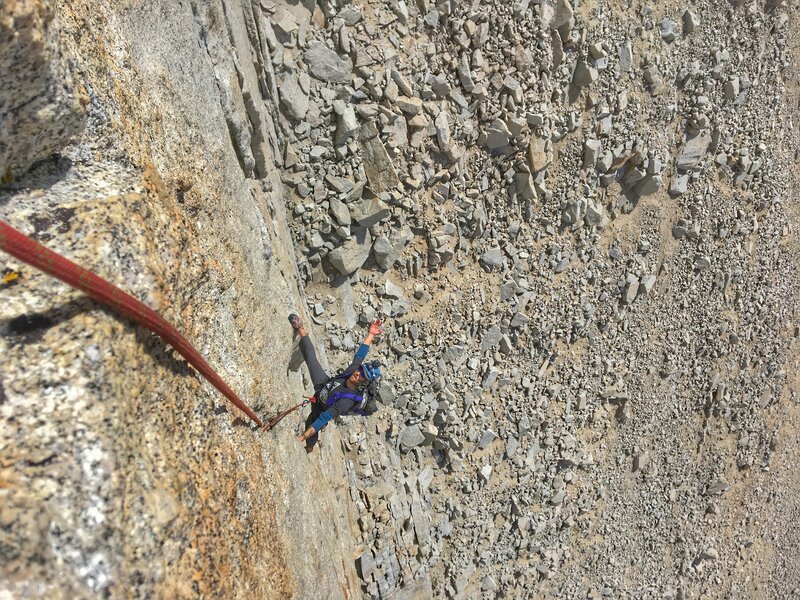 Almost every pitch on this route provides engaging and high-quality climbing. It is rightfully one of the 100 best alpine climbs named in John Moynier and Claude Fiddler’s book Sierra Classics. We had this Sierra jewel all to ourselves and throughout most of the climb, were blessed with bluebird skies and low winds (The weather forecast for the day was supposed to be sunny and clear). 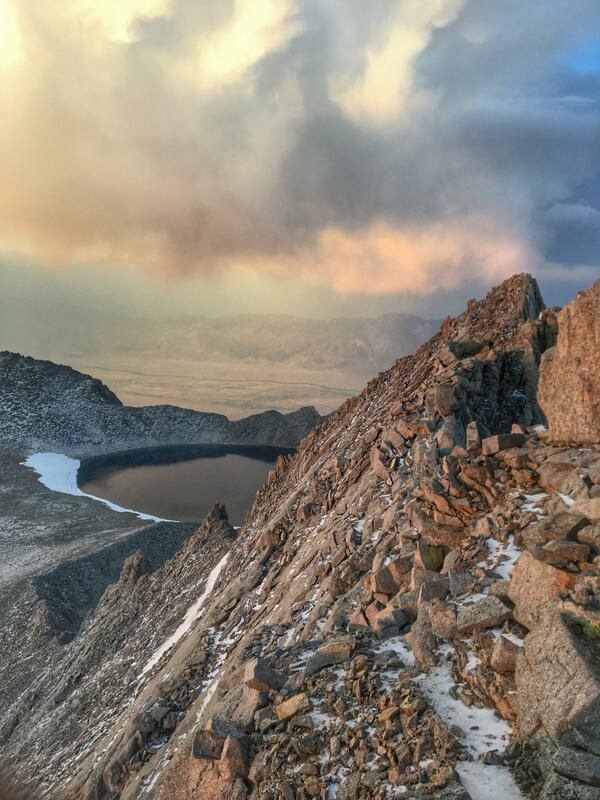 But, all this changed as we got closer to the summit we were greeted by a High Sierra, hail storm that sent pea size hail to usher our arrival! Not to seem rude we decided to hunker down 40 feet below the west summit for a few hours before heading back down the East Ridge & South Face of Mt Russell. Mt. Russell is the 7th highest peak in California, and one of 15, 14,000 foot peaks in the state. 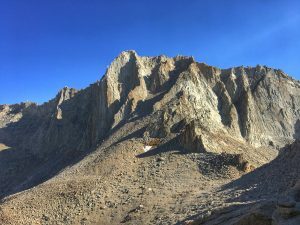 It is located right in the middle of the heavily traveled Whitney zone, but because there is no easily hikeable route on this mountain it does not see as many visitors as the neighboring Mt Whitney. R.J. Secor in his book, The High Sierra calls it the finest peak in the Mount Whitney region. The first ascent of the mountain was done back in the golden age of Sierra Nevada exploration (1926) by Norman Clyde. The Fishhook Arete though was not successfully climbed till 1974 until the British and American due of John Clearer and Gary Colliver came along. 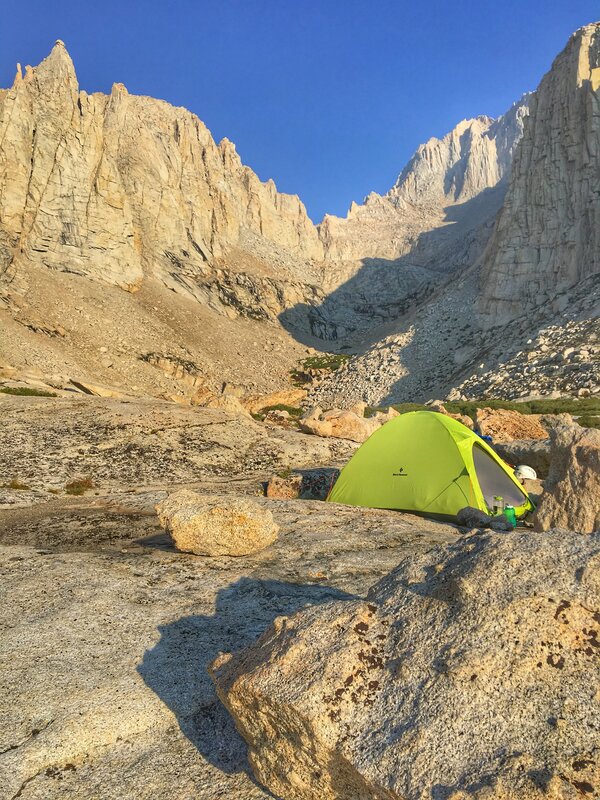 Like many others, we started our journey from the famous and crowded Whitney Portal, under clear skies, warm conditions and with heavy packs! Our hike in was pretty uneventful, taking our time we made it past the Ebersbacher ledges and decided to hang out and rest a little at Lower Boyscout Lake. After snacking, hydrating and resting for a little bit we started back up towards Upper Boyscout Lake (UBL). Another hour of hiking brought us to UBL, where we set up camp, ate some more and socialized with our neighbors. One of our neighbors was Tim, a guide with SWS Mountain Guides. Tim told us about his personal trip up Fishhook Arete a few years ago and after talking some more we discovered we had the same instructor for our AMGA SPI, none other than Viren Perumal! The three of us chatted for a little while longer and since Tim was tired from a long day in the mountains and Ty and I were planning on an alpine start the next day, we decided to call it a day. Ty: Do you even Alpine start bro? A shortcut to Iceberg Lake that Tyler and I discovered and named! 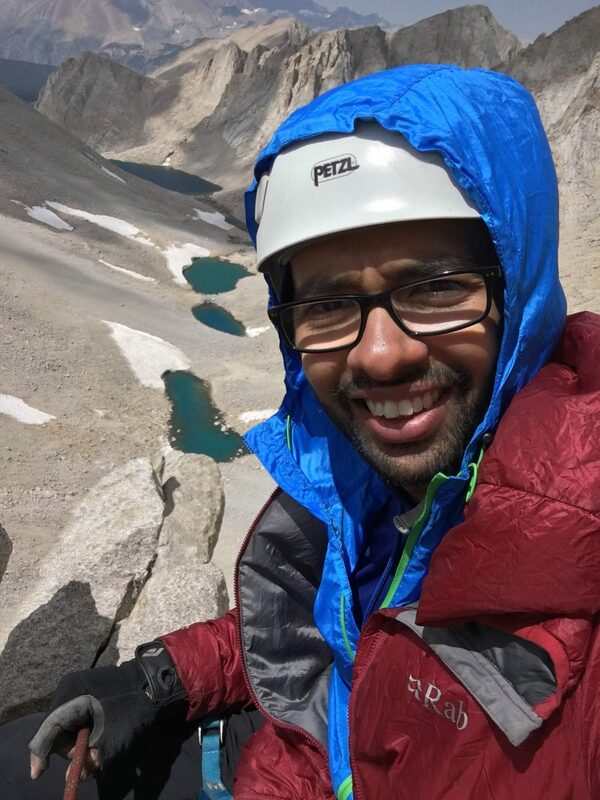 If you are not scared of soloing a little bit on easy class five terrain there is a ledge system on climbers right side (North) of the North Fork trail between Upper Boyscout and Iceberg Lake. If you can find it, this will shave off about 40 mins from the approach time! 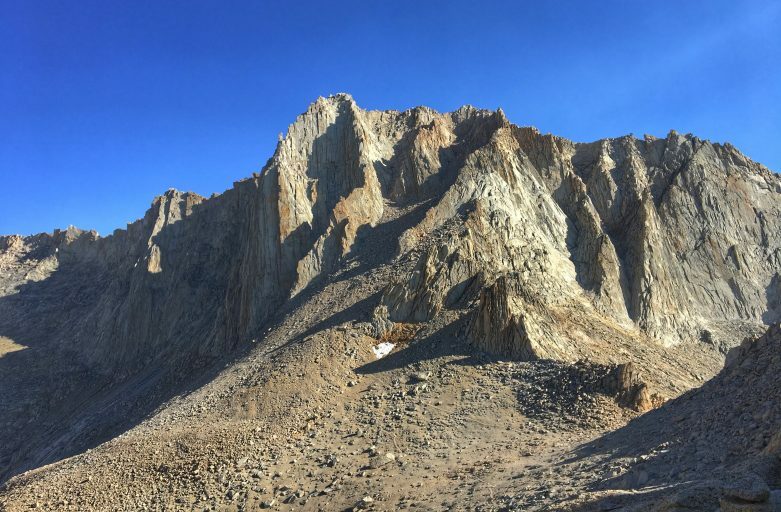 Mt Whitney East Face and Buttress completely snow-free and in perfect shape for rock climbers, get after it guys! The next morning I snoozed the alarm clock (my phone) a few time too many and got up an hour later than planned! We then took longer to get ready than we thought and rest assured the anticipated alpine start never really became a reality! 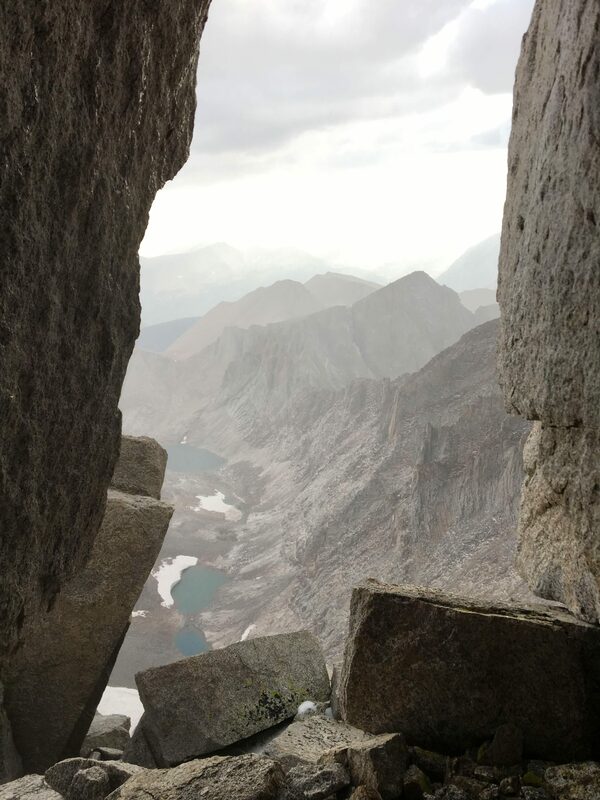 The hike to the base of Fishhook Arete from Upper Boyscout Lake is a not long but being at high altitude and can take longer than you think. Thankfully our cartographic skills helped us discover the “AT Ledges Cutoff” which saved us about 40 mins (see above). 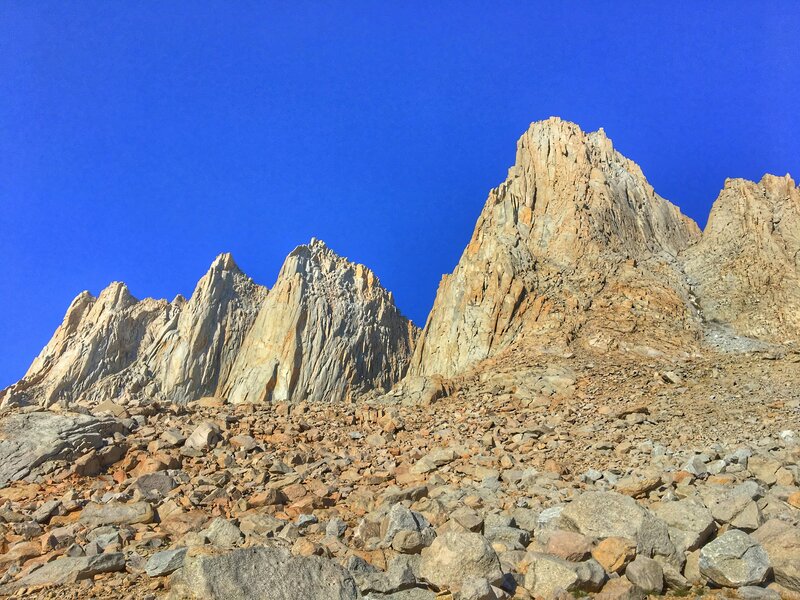 Before long we were at the top of Whitney-Russell pass staring in awe at the South Face and Fishhook Arete of Mt Russell! 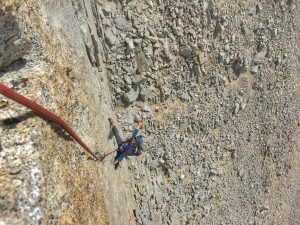 I started, by leading the exciting first pitch of Fishhook Arete which many claim is the crux of the route. 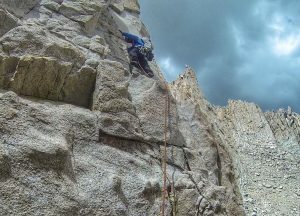 The climbing here is engaging and fun but the route can be protected really well. Ty and I swung leads and we cruised past the first four pitches of the route in no time. 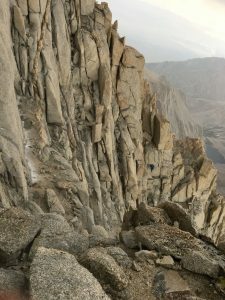 After the first four pitches, the arete turns on itself and the route requires 10 feet of down climbing into a notch. After the notch climbing gets easier yet the pitches are longer and far more exposed. The notch also marks the point of no return, in that it is possible to bail from the route at the notch without leaving any gear. 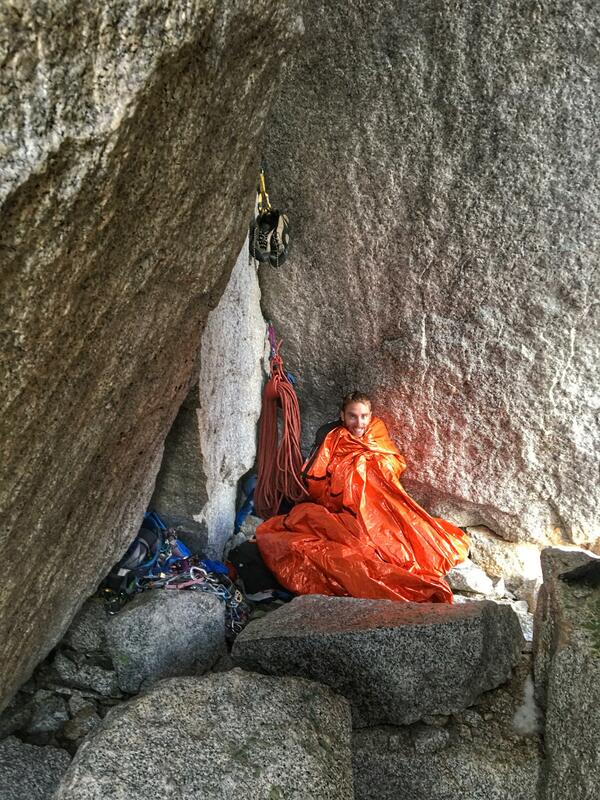 If one chooses to bail any later, one might be forced to leave some gear behind. Up until now, we were climbing under a bluebird sky, low winds. We had many hours of daylight left so we did not think twice about continuing on. 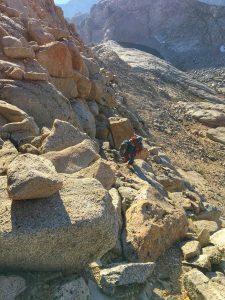 With the crux of the route behind us, we were pretty certain about topping out and then enjoying the mellow East Ridge descent towards our camp at Upper Boyscout Lake. Ty following up on pitch one which many will say is the crux of the climb! Belaying Ty on P2 with Arctic Lake and Whitney creek visible in the distance. On the sharp end, pitch six when the clouds and weather started moving in from the west. It was only after pitch five that the weather showed any signs of changing, the winds started picking up slowly and we could now see a few clouds moving in from the west. Since we only had easier climbing ahead of us I decided to climb up fast and run out the gear as much as safely possible. Ty did a great job following up fast and we covered a lot of ground. Even though we could now see the ominous clouds right above us we had finished all roped climbing before the first drop of precipitation around 4:30 pm. From here we put on our hard shells, unroped and soloed the rest of the route over class 3-4 terrain as pea-sized hail started coming down all around us. We were now all done with technical climbing and were right by the summit, but the hail and rain had made the rock very slippery and dangerous. I made the judgment call that it was too risky to descend the East Ridge in such conditions, so we needed to do the next best thing; find a shelter and wait out the storm. From my last trip to Mt Russell, I remembered a sheltered spot about 30-40 feet below the west summit of Mt Russell. We found this protected cave and tried to follow the surviving a storm guidelines that I remembered reading. Following the protocol, we put on all warm clothes and tried to keep dry, to ward off hypothermia. 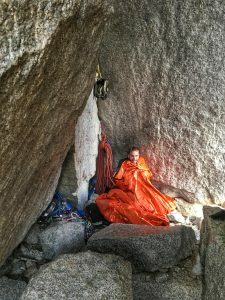 We put aside all our metallic climbing gear and sat on our backpacks to reduce any direct contact with the rock or water. We were as far away as possible from the entrance of this cave. Thankfully we did not see or feel any lightening in the sky even though we could hear thunder in the distance. We were a little low on drinking water but to be honest this was not an awfully uncomfortable stop to be in! We must have waited about 2 hours in this shelter when the storm started to die down around 7 pm. We packed up all our belongings and started to descend at first the East Ridge and then the South Face of Mt Russell back towards Whitney-Russell pass. Look carefully and you will see Ty (a little blue dot) soloing the class 3-4 sections to the top of Mt Russell with hail coming down! 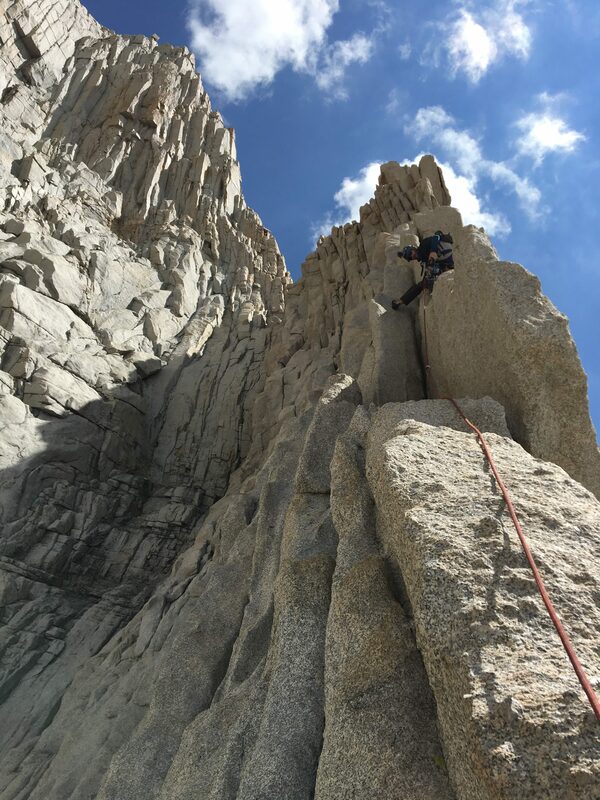 This was a wonderful climbing trip along with spending time on world-class, Sierra granite, Ty and I got to learn a lot of things. Some of the takeaways that I would like to share is to always remember that even though the mountains have some of the most fun climbing routes, they are not gyms. The weather, conditions, and terrain can drastically change so it is very important to come prepared and with an exit strategy. When attempting a challenging route it is imperative to study the route, maps, and topo really well. It is also important to trust your partner and never let your pride get in your way or let summit fever cloud your judgment. The mountains will still be here tomorrow but if you make the wrong choices often enough, you might not! Mike thanks for the sharing this. 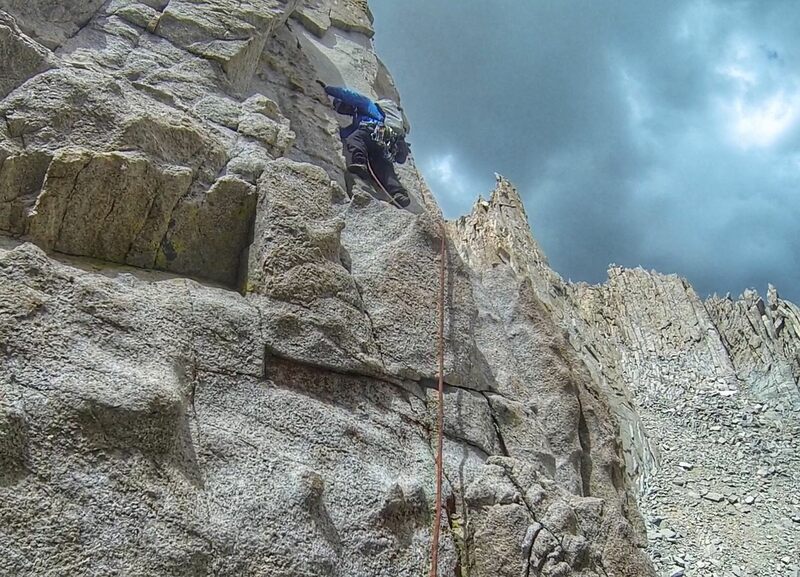 The approach to the base of the Fishhook Arete is about 4 miles and gains about 5,000 feet in elevation. The climb itself gains about 700 feet to the summit of Mt. Russell. 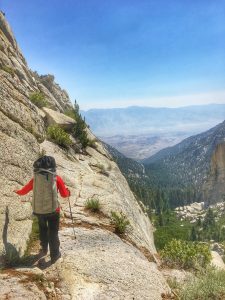 The typical approach involves hiking the Whitney Portal trail for about a mile and then turning off on climbers’ trail that heads up the North Fork of Lone Pine Creek. The trail climbs past Lower Boy Scout Lake, Upper Boy Scout Lake, and Iceberg Lake before passing through the Whitney-Russell Pass and then traversing to the base of the Fishhook Arete. This “standard” route is shown in orange on the map on the left, which is a photo of the map in the SuperTopo guide. The white arrows represent our approach while the black arrows represent our descent. Explanation of the red line on the map route overlay: In our eagerness to get to the climbing route, we missed the turnoff for the climbers’ trail up the North Fork of Lone Pine Creek (it’s not quite obvious although there is a sign that names the creek, just not the trail). We hiked a few miles up the Whitney Portal trail before realizing our mistake. (This mistake ended up plaguing us the entire approach route.) We turned around and hiked back down the trail a ways, and then did a bit of cross-country travel to get over to the North Fork of Lone Pine Creek valley. But instead of descending to the climbers’ trail we knew was in the valley bottom, we stayed on a ridgeline above the south side. When we finally dropped down at a lake we figured it was Upper Boy Scout Lake, assuming (incorrectly) we had bypassed Lower Boy Scout Lake. So, when we arrived at the next lake, we assumed (incorrectly) this was Iceberg Lake, and headed into the basin beyond to access what we assumed (incorrectly) was the Whitney-Russell Pass. All the while we were getting more and more confused that things just didn’t look “right”. 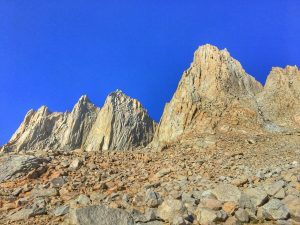 When we finally had our ah-ha moment and realized that our assumptions had been a lake offset the entire approach, we figured out a reasonable way to get to the base of Fishhook Arete. 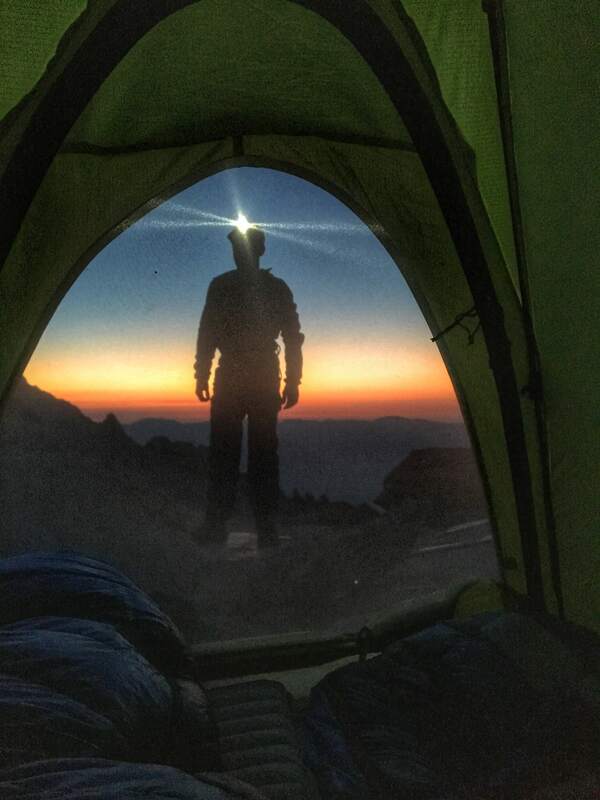 It took us 6 hours to get to the base of the arete, rather than the 4 hours we had predicted. Most of the time was lost in backtracking and constant hesitation rather than the actual route we took, since our approach route above Upper Boy Scout Lake was perhaps more direct than the standard approach via Iceberg Lake.